What's the general verdict on LC's Commando Leopard, Codename Wild Geese and The Commander ? I think all 3 were enjoyable enough action thrillers with The Commander feeling closer in tone to 007. I'll be honest here and say although it was nice to Lew in action, these were clearly done too cheaply to float my boat. Some of the acting was a bit questionable too with inauthentic dodgy screams as folks were getting shot and performing olympic style dives to their death. Sadly 'Who Dares Wins' and William Bodie these are not for me but it's ALWAYS great seeing Lewis Collins on screen. All very so-so European action movies. They are all watchable but I wouldn't bust a gut to do so. NB: The UK version of 'The Commander' is slightly cut for a brief scene of c¤ck fighting. Over the weekend they aired 'Codename: Wild Geese' on Movies4Men channel. Good god, it was dire. After about 30-minutes I had to turn the TV off. This is the perfect cure for insomnia. As I've mentioned before Lewis's talent was largely wasted. Bless him. I think 'Codename: Wild Geese' is the best of the three LC continental movies. It has its moments but it is no classic! Good grief. Dread to think what the others were like. Codename: Wild Geese is no classic but there are worse jungle combat movies from that era. All of the above were West German/Italian co-productions which starred Lewis as a mercenary or freedom fighter. He was certainly typecast in those days! 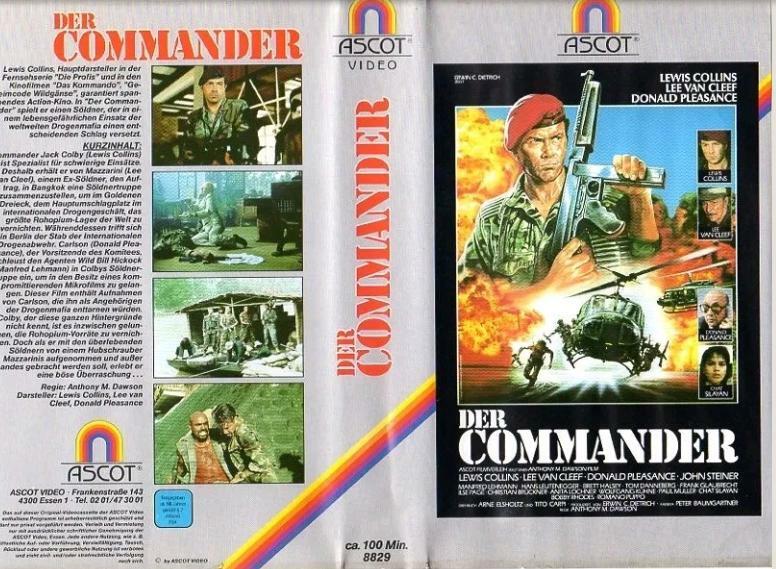 Sadly only 'Commando Leopard' is the only one of these movies available Uncut in the UK. If you wish to see these films uncut then you need to source BDs or DVDs from Germany. I own uncut versions of them all and will be reviewing them shortly. I know that none of these three can be classed as great, but they each have their moments and are all very easy viewing (with a beer and take away of your choice lol) plus its always nice to see LC in something!. Of the three I think that Codename Wild Geese (had it a larger budget and no dubbed actors) could have been Lewis' stepping stone to international leading man status - there are certain scenes (mostly set in Hong Kong) that are up to scratch cinematically speaking and would have fit easily into any Bond film. A trio of guilty pleasures if you like ! Of the three films, I've only seen Codename: Wild Geese which is no classic but I always found entertaining. It has a decent cast for an action film and the potential for being a better film. The ethics of hiring mercenaries to take out drug dealers is interesting. In my little area of the USA this movie was a fixture in VHS rental sites. I don't know why but nearly all of them had it. Easily the best of the three LC movies. It was made to cash in on the success of the 1978 British movie 'The Wild Geese' of which it shares nothing but a title. Filmed pretty much entirely on location in Hong Kong and The Philippines. It was made over several months from May 1984, some two years since filming on 'Who Dares Wins' had ended in Spring 1982. Joining LC were some big name guest stars: Lee Van Cleef, Ernest Borgnine and Klaus Kinski. Kinski's dubbed voice in this movie is great, he sounds like Mr Cholmondley-Warner from those Harry Enfield sketches! The main German cast were: Manfred Lehmann, Thomas Danneberg (both appear in all 3 films as different characters)and Frank Glaubrecht (also in 'The Commander' as another character). I don't think the producers cast their net too wide when casting for local talent! The plot? From IMDB: "Commander Robin Wesley (Lewis Collins), leader of a group of mercenaries, go to the Golden Triangle in South East Asia to overthrow the dictator, who is a major manufacturer and dealer of the world's opium." This film has pretty high production values despite having some car model work that would have disgraced Series 7 of 'The Dukes of Hazzard' . The model work with the explosions is particularly well handled and looks very good. The HK and Philippines look fantastic and you have to feel a bit sorry for the cast and crew having to film in extreme heat of the jungles. This is a very violent movie but sadly the current UK DVD is missing 13 minutes of footage! And the print on the Arrow BD of 'The Wild Geese' (1978) as a Bonus Feature is a disgrace, it is a poor VHS standard. To get the uncut version you have to look to Germany, Austria or Switzerland but not all of those DVDs are uncut. The running time of the uncut version is around 97 minutes, the cut version is circa 84 minutes. What is cut? It is mainly the killings. You don't see so many people die. This film has a very high body count but not in the cut version. And also a large chunk is missing when they find a guy who has been crucified by the evil drug warlord. Of course, there is precious little character development and few surprises. It is a typical Italian rip off of a successful foreign movie but darn good fun as it is very action packed from beginning to end. The typical mid 80s synthesizer music by Eloy would drive rats. According to the end credits they use Yamahas. TBH, it would have sounded more pleasant if they revved up four Yamaha motor bikes! Yes folks Eloy are that irritating. An accurate and fair assessment of the movie, MIAS. Thanks for the information on the various running times. Something I dislike about the movie is the music score. I hated all that keyboard cr*p when it was current and my opinion hasn't mellowed over time. I suspect the producers saved money by doing the music that way. I always wondered why Wesley uses a World War Two era Thompson Machine Gun. It gets the job done but it seems like a mercenary would have more up to date equipment. His men did. I think this is easily the weakest of the three movies directed by Antonio Margheriti (as Anthony M. Dawson) with Lewis in the lead role. The budget was clearly all spent on some truly spectacular model sequences and they could only afford Klaus Kinski as the token big name guest star. Lewis plays Carrasco who is trying to overthrow the evil government in a South American country. Quite why they chose LC to play a South American guerilla fighter is anyone's guess. I suppose it did break the sequence of him acting as a mercenary. Although, TBH, LC would have made a more convincing foreign mercenary drafted in by the beleaguered peasants. What helps lift this movie are the incredible special effects when a dam is blown up and an airliner crashes. They must have spent most of the budget on this aspect of the film because they are very convincing. The storyline is very tedious and Kinski doesn't seem to care that he is in this film. I personally found this a chore to sit through really. Not even stellar special effects can make up for a deadly dull storyline and script. The death count in this film is very low compared to its predecessor. This film was shot on location in The Philippines (again) and Venezuela. This is the only one of the trio of films to be released totally uncut on DVD in the UK. The print is pretty good. Because of the effects sequences, I will give this an extra mark. I forgot to mention the music score! Drat! I will amend my review! Thanks pr1. The last of LC's trilogy of foreign action movies and a definite step up from its predecessor. This time the budget stretches to two big names guest stars in Lee Van Cleef and Donald Pleasance. Van Cleef was really looking well past it in this despite being aged only 62. The filming locations are stunning in this film especially the Amalfi Coast in Italy, a wintry Berlin, Bangkok and The Philippines (for the third time). Filming commenced in Berlin in October 1987. Fans of mercenary movies will be delighted that LC is back playing one, this time he is Major Colby. I presume his first name wasn't Jeff? Van Cleef is the baddie in this one but there is also a traitor in US Intelligence in Berlin. Donald Pleasance is very good as the US Intelligence Chief despite his suspect American accent. You can see he is having great fun in this movie. A shame he has to stay in Berlin. The bit at the end in Italy, you can see poor old Donald is not actually there, he has to appear in front of a painted backdrop in the studio. Obviously the budget didn't stretch for him to fly from Berlin to Salerno! The plot? A group of mercenaries (led by LC) has to get hold of a computer disc full of a drug lord's contacts. And wait for it! One of LC's men is a plant, he has had plastic surgery to change his appearance and infiltrate LC's group!!!! Can LC work out he is not the man he is supposed to be? Will the traitor in US Intelligence in Berlin be unmasked? Not as action filled as the first movie but this rattles along at a fair old pace and there is quite a high body count. I wasn't bored like I was with 'Commando Leopard'. I like the way they reused some of the spectacular explosions from 'Codename: Wild Geese'! Sadly, the UK DVD is cut by around a minute. This is because there is a scene of c0ck fighting. The German DVD is uncut. So, not too bad an end to his film starring career. No classic but a good film to watch whilst having a few beers. Thanks MIAS for the reviews of Lew's Merc movies. I found them very useful. I haven't checked that closely but it looks like the trailers and complete movies are YouTube. Keep an eye out on movies 4 men channel, these have all been shown a few times recently. Worth watching if nothing else on, dodgy model action scenes and overdubbing have got to be seen., especially the car chase through the tunnel with Lewis in a Pontiac trans am! I actually quite enjoyed The Commander though. Even when watching The Professionals reruns now, I think that Lewis was a good actor, seemed genuinely witty and his lines flowed well (in my opinion), these movies seem a step back, perhaps it was him and Martin bouncing off each other well. What time of day are they shown? I can see 'Codename: Wild Geese' being cut even more if it was aired pre 9.00pm. Usually quite late, I'll keep an eye out and try and update site, they run different themes at weekends (war, action, fighting etc...)channel is not in many tv guides so you've got to keep checking. Just seen The Commander is on 12.40 am 27/5 on Movies4men! Codename Wild Geese on 29/5 11.40 pm Movies for men. 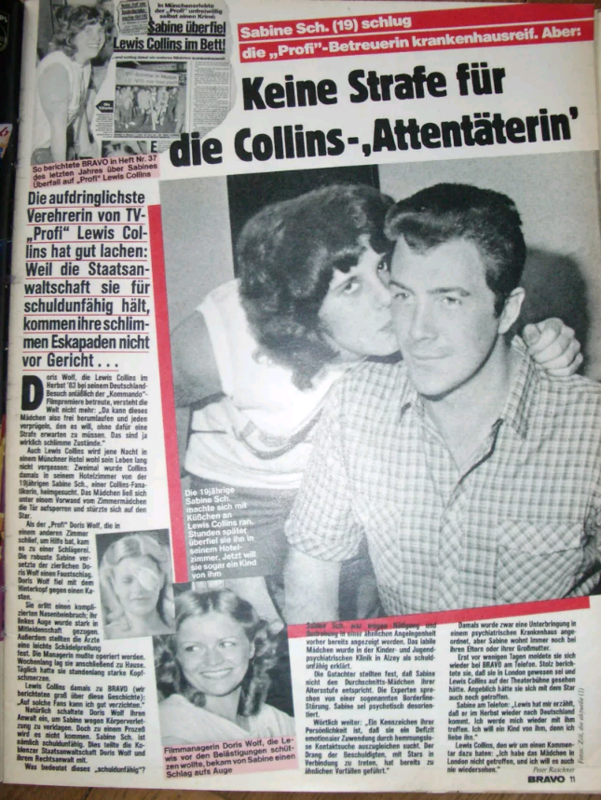 German magazine reporting Lewis Collins and crew member attacked in 1983. This one might take a bit of translating but basically in the top left, German pop magazine Bravo states that in autumn 1983 19 year old arguable nutjob 'Sabine', an over obsessive LC fan, attacked LC in bed at a hotel in Munich while filming 'Commando Leopard' and Doris Wolf (crew) got punched in the eye trying to look after him. Frau Wolf (pictured) ended up in hospital with her injuries. It seems Sabine, despite her antics was not pulled up into before a judge and basically got away with it. She claimed she loved Lewis and wanted a child with him. At the time Lewis supposedly said "I can do without such fans". Terry and watermania will be able to do a far better job at translation than me. Sabine would be 53 now. Although don't hold your breaths on whether this is really true....Bravo is more of a kids boulevard rag. There's no school like the old school, and I'm the f*ckin' headmaster ! Headline: "No consequences for Lewis Collins' Stalker"
The most obtrusive admirer of TV "professional" Lewis Collins has a good laugh. Even though the prosecution considers her guilty, her escapades won't go before the court. Doris Wolf, who supervised Lewis Collins in autumn of 1983 during his visit to Germany for his "Kommando" film premiere, doesn't know what the world is coming to. Doris said "This girl is able to walk around and hit whoever she wants without any sort of consequences. What is the world coming to?". Even Lewis Collins will probably never forget the events of that night in a Munich hotel. The fanatical 19 year old Sabine S. visited his room twice. The girl posed as a maid in order to force her way on to the star. As Doris Wolf, who was sleeping in another room at the time asked for help, the situation soon turned into fisticuffs. Sabine punched Doris and Doris fell injuring the back of her head on a cupboard. Doris suffered a broken nose and seriously injured her left eye that mean Doris needed surgery. As a result, Doris was off work for weeks and suffered persistent headaches. At the time Lewis Collins told BRAVO (who had covered this story a lot at the time): "I don't need these sort of fans". Doris approached her solicitors accusing Sabine of grievous bodily harm. However, it will not come to trial because Sabine S is "doli incapax" ( en.oxforddictionaries.com/definition/doli_incapax ) - this was reported by Doris's legal team. But what does this actually mean? Sabine's menacing behavior as a result of a similar matter had been indicated before this came up. She had already attended a psychiatric clinic and been declared incapable of blame. An expert claimed that Sabine was not a typical girl of her age and suffered from borderline psychiatric problems. She has a history of wanting to connect with stars. A psychiatric evaluation was ordered, though Sabine is still living with her parents or her grandmother. She contacted Bravo a few days ago and reported being in London having seen Lewis Collins on stage, and she had allegedly met with the star again. She said "Lewis told me he is coming to Germany again in autumn, he wants to meet me. I want a child with him because I love him". Lewis Collins stated: "I never met the girl in London and I don't ever want to see her again".